Time to lighten things up! Judging from the news media, you might think we’re living in dark times and that the world is collapsing onto itself with all its citizens rising up against each other. Until you fall into the “Good News” tab of Huffington Post. There you will find stories of kindness and inspiration from around the globe. My favorite today: For Past 3 Years, Teen Has Carried Fellow Student who has Muscular Dystrophy to School. 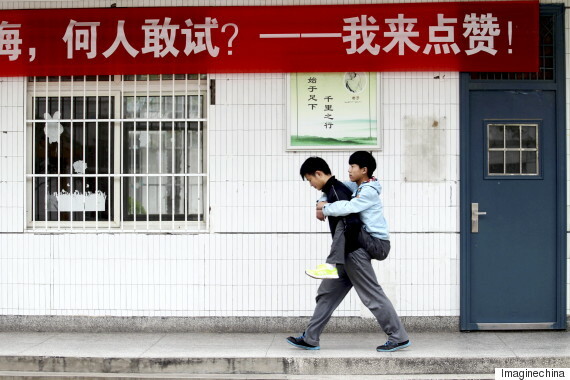 High school student Xie carries his friend and classmate Zhang at least 12 times a day from the dorm and back and from class to class. And brings him food. They are both top students – and Zhang has never missed a day of class. That’s a lot of compassion and loyalty. Read some good, then go do some good!